I'm a proud owner of one of Elizabeth's beautiful wreaths (Wisdom) and I absolutely ADORE it. I stare at it every day, and to me, it represents the craftsmanship and artistic vision of the handmade community that I've come to respect and love - which gives me something to write about every day. I can't wait to have someone to pass it down to, it will definitely be a family heirloom!! The amount of time it takes for step one can range from a few minutes to more than an hour depending on where I go to get the book. I gravitate toward books from the early 1900’s with worn covers, yellowed and ripped pages. I like books that were loved by the previous owner, books that have been in someone’s library for many years, and books with personalized bookplates and/or handwritten name and dates. Book titles and subject, paper weight and texture are also taken into consideration. I find my books at library sales, estate sales, the free book carts at the library, garage sales and thrift stores. 45 minutes. I begin by removing 190+ pages from the selected book and cut sheets down to size using my guillotine paper cutter. This is a meditative time – a time for reflection. I love listening to my Pandora.com stations while working on wreaths. Stations include Interpol, Arctic Monkeys, The Shins, and The Strokes. The best time for me to work on my wreaths is after the kids are fast asleep. This allows me to have uninterrupted time to focus my attention on the details. 1 hour 45 minutes. I love eating my favorite candy, Hot Tamales, and drinking ice tea while I fold the paper into fourths and shape with decorative scissors. 25 minutes. My accent paper selection ranges from scrapbook paper to high-end gift wrap to found paper and vintage books. I like to use a combination of complimentary and contrasting paper colors depending upon the theme. 1 hour 35 minutes. As with step two and three, I begin by cutting the accent paper down to size and shaping with another favorite decorative scissor. 1 hour 5 minutes. 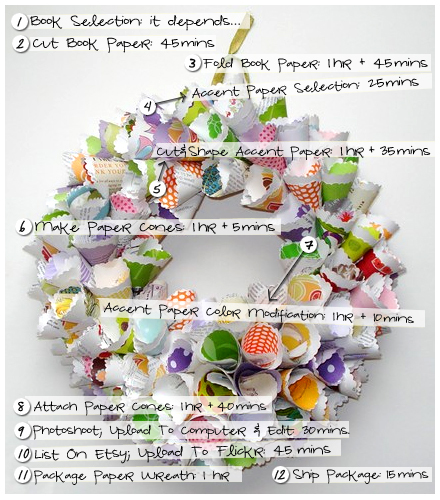 Step six is when the paper wreath comes to life. I combine the shaped book paper and accent sheets, fold, roll and staple. 1 hour 10 minutes. After seeing the completed paper cones together, I decided to add greener accent to the mix. I did not have the correct shade of green in my paper collection so that required an “emergency” trip to the hobby store. I returned from store and immediately cut the scrapbook paper to size. Then I folded and shaped with the decorative scissor #2, combined with book paper, folded, rolled and stapled. 1 hour 40 minutes. I attached rolled cones to wreath form and strung a ribbon to hang. After the paper cones were intact, I double-checked the paper wreath to ensure that there were no bare spots. I also attached a handmade “haru.etsy.com” tag to the backside of the wreath. Most of my paper wreaths include a paper butterfly or a special word or message. That can take an additional 30-45 minutes to prepare the paper butterfly, print the special word/message, attach to a wire and adhere it to the wreath form. 30 minutes. I have found that best time to photography the paper wreath is in the morning when the sun gives off a warmer light. With my morning coffee in hand (and breakfast prepared for my kids) I am able to “quickly” photograph, upload and edit my photos. 45 minutes. Depending on my source of inspiration, the time it takes to write my etsy product description can vary from a few minutes to more than half an hour. Flickr.com is always my next stop after Etsy to upload and send my photo to my groups in the flickr.com community. In addition to Etsy, I have found flickr.com to be a wonderful source of support and inspiration, and I would highly recommend it to everyone! 1 hour. Attention to careful packaging is crucial because of the delicate nature of the wreath. To minimize movement during shipment, the paper wreath is attached and secured to a cardboard sleeve and wrapped with bubble wrap. Then, I tie one of my favorite ribbons around the wreath and include a little thank you note, my business card and a “how to remove your paper wreath’ instruction card. The exterior presentation of the package is my last opportunity to make it special for the recipient. I use my favorite typewriter font to print the “to” and “from” labels and I add a color detail with strips of paper from my previous designs. 15 minutes (depending on shipping location and time of day). Luckily, the USPS office is close to my home. I love the convenience of the automated shipping center because of its quick and easy-to-use features. Standing in line to ship international package can take me up to 15 minutes. Well, I too am a huge fan of Haru's wreaths.....and now, hearing all that goes into each piece...just leaves me smiling ear to ear and even more in love with her work! Thank you Beth for sharing! Those wreaths are so beautiful! I love these little glimpses into the artists world. Thanks so much for sharing these! thanks Marichelle, Melissa and Rachel... This was a fun experience.